I suppose one of the fruits of listening to Catholic radio in the morning is learning about all sorts of different things. One day recently, I overheard them talking about a new CD by cloistered nuns. Basically, the background is…this husband and wife, after years of working in the recording industry, decided to start their own record company with the idea of recording the music of religious communities and all other sorts of Sacred Music. They really try to capture the authenticity and genuineness of their recordings by recording the music in the religious community’s natural habitat (ie. in their church/chapel, etc) doing their normal singing/chants. 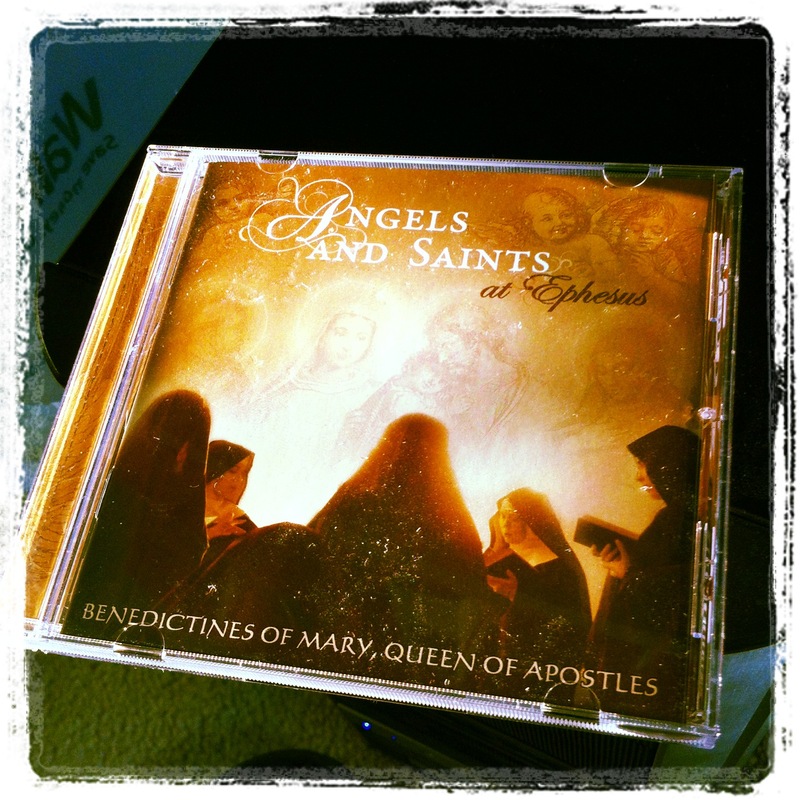 They were on Catholic radio promoting this new CD with recordings of the Benedictine Sisters of Mary, Queen of Apostles. This community of cloistered nuns follows the rule of St. Benedict for monastic life and they chant in Latin. The Benedictines of Mary, Queen of Apostles is a monastic community located in rural Missouri. Consecrated to the Queen of Apostles, their lives are dedicated to contemplative prayer, especially for priests. They support themselves primarily by making priestly vestments. Professing full obedience to the Church’s teaching, the community upholds a loving commitment to preserving the liturgical heritage of the Church in the Extraordinary Form of the Mass and traditional monastic Office. This is their second recording with De Montfort Music and Decca Records. Because they are cloistered, it’s difficult to get a hold of them and they don’t go out in public, but I’m grateful that De Montfort Music reached out to them and recorded their beautiful music. And my primary motivations for even getting the CD in the first place was that my iTunes library is lacking sacred music, and I figured I could use this for future Catholic reasons, whatever they may be. I was sold after listening to a sample of a song on their website. Called to embrace a liturgical spirituality, our lives literally revolve around Christ as a many-faceted jewel, manifesting His majesty through the mysteries of His own life, that of His Mother, and by extension through His holy ones, the angels and saints. The feasts of the angels and saints reflect the Light of the World in their own way, reminding us to follow them, shining forth only insofar as we reflect Christ. At the Priory of Our Lady of Ephesus, these interspersed feasts are especially commemorated in song. The saints and angels are honored either in hymns written for them or, in many cases, hymns written by the saints themselves. In this way, we can take up their own words to share in the eternal hymn they now continually raise to God. It is our hope that this music raises your hearts likewise to Him, that at the end of our life here, our souls may be prepared to share the company of the angels and saints when we behold God face to face. Awesome! Yeah, I think these hymns, as performed by them, definitely has that effect. I decided to listen to it the first time while I was at work and things got pretty stressful. Their music helped me stay more at peace by reminding me of God by uplifting my mind (through my ears) to Him. Cliché-sounding, but true. And really…because the recordings are done well…because they sound freakin’ awesome…because the words, even though I don’t know Latin, are directed at God, I cannot help but think of Beauty, Goodness, and Truth! And fun fact! Angels and Saints at Ephesus has been in the Top 10 of the Classical Albums Billboard chart since its release a month ago.